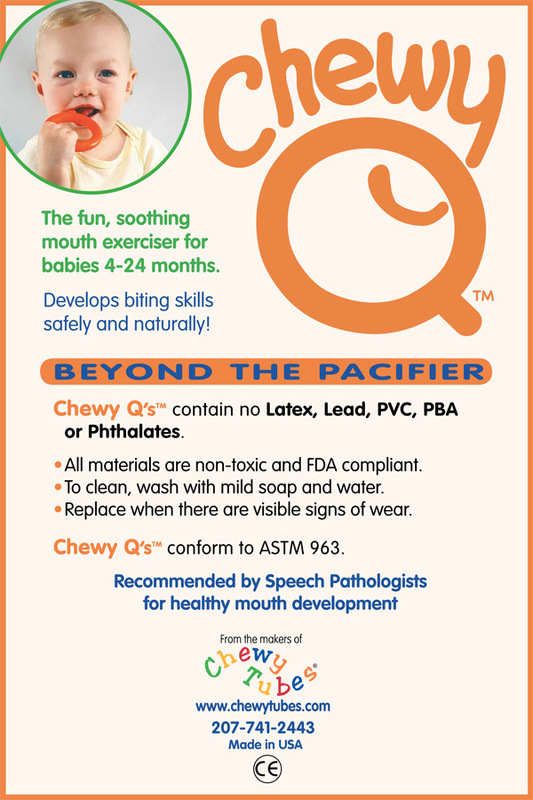 Chewy Qs encourage early mouthing experiences that support the transition from midline tongue exploration to lateral jaw movement. This transition facilitates the development of the masseter muscle so critical for mature speech production as well as biting and chewing skills. Graded up and down jaw motion needed for biting and chewing skills. Using the stem-like protrusion as an object of oral interest, an infant of 5 to 7 months will naturally move the stem to the side of the jaw to bite on it. This biting input helps to mature and strengthen the masseter muscle which is in charge of closing the jaw for biting, chewing and talking. The development of healthy upper and lower dentition by eliminating the risk of an open bite (space between the upper & lower front teeth that prevents complete closure) due to rigorous pacifier use or thumbsucking. Healthy alignment of the upper and lower teeth laterally by preventing improper positioning due to aggressive sucking on the pacifier. Mature tongue movement by providing tactile stimulation and interaction with the stem-like protrusion of the Q for side-to-side tongue exploration. This stimulation is especially important at 5 months (and beyond) when the baby’s tongue naturally develops a horizontal plane of movement inside the mouth. Does not allow up/down jaw motion to practice biting skill – In fact, if baby opens her mouth it will fall out! Does not permit tongue movement – The tongue must stay positioned in midline to hold it in place. Can potentially indent baby’s hard palate especially with strong sucking, permanently changing its shape. Baby’s sounds are limited – a pacifier does not allow mouth opening and closing, a skill needed for sound play. Pacifier use keeps baby’s tongue and jaw predominantly closed and unavailable for oral breathing. Typically cannot be grasped by a young infant and placed in the mouth when sucking is desired. Can inhibit proper dental growth and promote an anterior bite as well as a cross bite.